The Federal Hill Riots of 1914, often called the “Macaroni Riots,” epitomize the struggle of immigrant communities in Rhode Island. As World War I was breaking out, food prices spiked. Laborers gathered on street corners to listen to “agitators” blame business owners. A mob formed that attacked wholesale grocer Frank P. Ventrone’s business block here. They smashed windows and hurled macaroni into the street. Police intervention quelled the disturbance, but the next day new confrontations sparked an even bloodier riot in which eighteen were injured, including 15-year-old Quinnio Oddi, shot by police. Over two weeks, there were five violent confrontations between Federal Hill residents and the police. 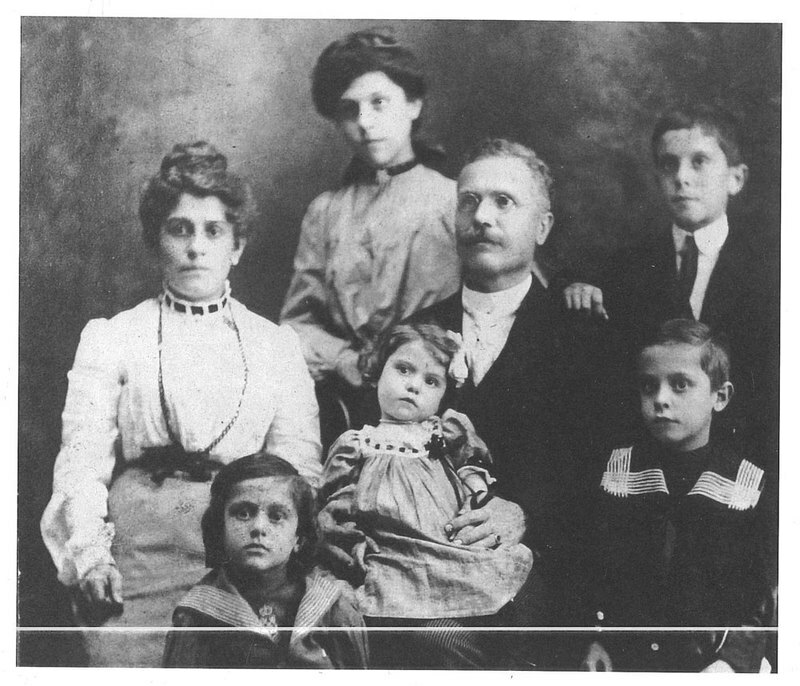 The violence manifested the desperation of Providence’s immigrant working poor. Child labor was the norm; long hours earned little pay; laborers were easily replaced and had no assurance of work; they had no voice in government. In the midst of this poverty and social unrest, radicals like Luigi Nimini agitated for change. Nimini published his Italian-language newspaper Il Ragione Nuova from his shop at 206 Atwells and founded the Karl Marx Club at the corner of Atwells and Dean, the same corner where radical speakers riled up the crowd in August 1914. 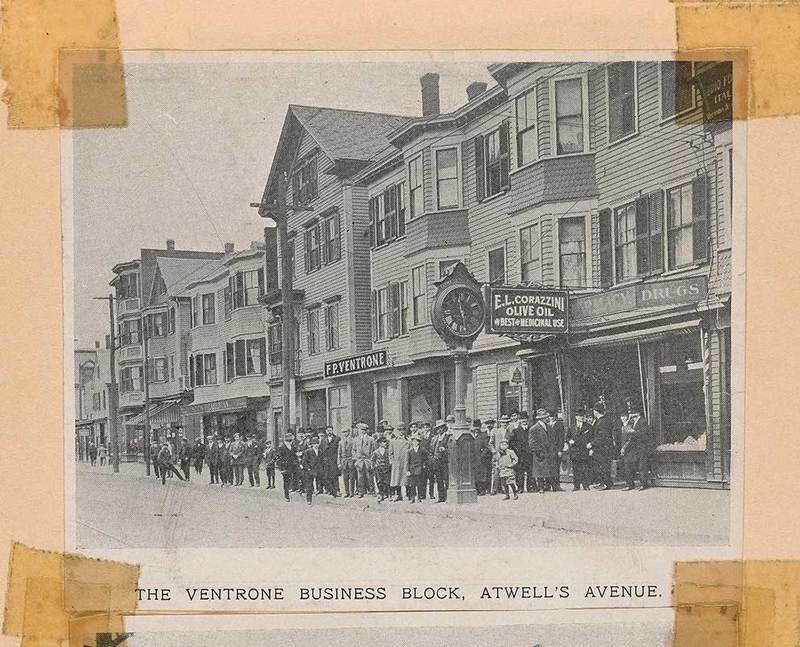 The “Ventrone Block” in 1910. ~ Source: Rhode Island Collection, Providence Public Library. Rolling Cigars on Federal Hill: In 1912, Lewis Wickes Hine took this picture of the Della Iacono family rolling cigars at 205 Atwells Avenue, just across the street from I.W.W. organizer Luigi Nimini's Socialist Club and printshop. A Police Guard: Police guarded the boarded up windows of the Ventrone Block after the riots of August 29, 1914. ~ Source: Evening Bulletin, August 30, 1914. Rhode Island Collection, Providence Public Library. 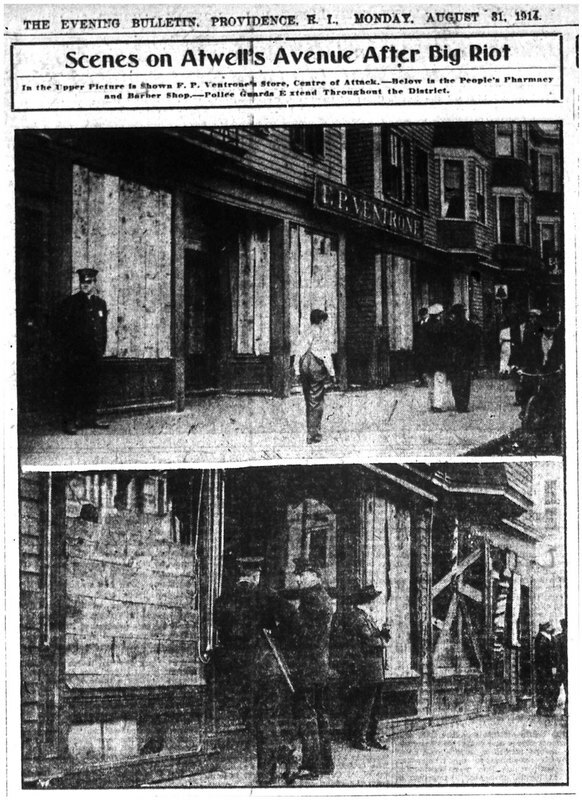 Taylor M. Polites, “Federal Hill Riots and The Frank P. Ventrone Block,” Rhode Tour, accessed April 21, 2019, http://rhodetour.org/items/show/152.